Do you use products that are tested on animals? | Memorable Days : Beauty Blog - Korean Beauty, European, American Product Reviews. Do you use products that are tested on animals? It's time for another question of the week. What do you think of companies that are testing their products on animals? 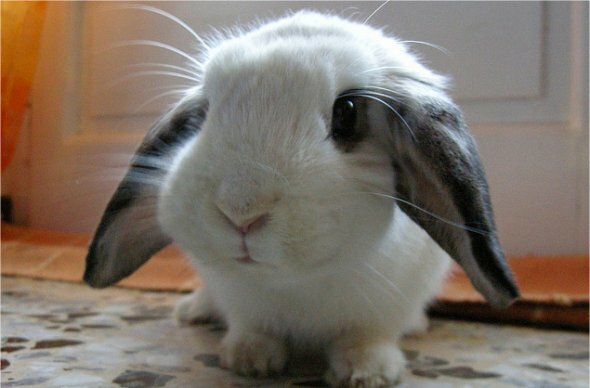 Look how cute and fluffy this bunny is >.<"OMG! This is probably someones pet btw xD and not a bunny that is used to test cosmetics. “Consumers are shocked to learn that millions of animals each year are injected with or forced to inhale or ingest cosmetics. Those animals live in fear and loneliness every minute of their lives,” says Erin Edwards, media liaison for animal-rights organization People for the Ethical Treatment of Animals (PETA). On a lot of products that I'm using it doesn't say if it's tested on animals or not. However, I did some research and found that lots of beauty companies do test on animals, like L'oreal (Garnier, Maybelline, Shu Uemura), Procter & Gamble (Herbal Essences, Hugo Boss), Shiseido Cosmetics and a lot more.. You can see more companies here. A lot of products that I'm using are tested on animals and I didn't even know it >.<". Lots of people have mixed feelings about this topic. Some people think it's better to test on animals rather than on humans. Some people are completely against it and won't use products that are tested on animals. What do you think about it? Do you feel guilty if you're using a product that is tested on animals? Are you against animal testing and do you use products that are tested on animals? What an interesting question! Well, when I was a teenager I didn't pay attention so I used everything I liked (but i didn't buy so much cosmetic stuff). When I started uni and I became a rep, I started to choose and to pay more attention. Now I want to discover more cruelty free products or product from brands don't test. Well, I really try to avoid using products that are tested on animals. Yes, i try not to use products that are testing on animals. It's hard work because in Poland, where i live, in drugstores it's about 90% companys that are not cruelty-free (l'oreal, garnier, rimmel, maybelline and many more). For a long time I thought it was common sense and that many of the brands I used didn't test on animals, but it came to my attention more recently. I bought a whole new make-up kit from a company that doesn't test on animal and I feel so much better using their products. I didn't know Herbal Essense tested on animals X____X I won't be buying their hair products anymore for sure. Ik heb wel eens een MNY pakketje gewonnen. Helaas is dat ook op dieren getest dus ik voel me wel schuldig dat ik het gebruik.. Het niet gebruiken is ook zo jammer! Nieuw kopen van MNY / maybelline doe ik zeker niet. Vroeger let ik daar niet zo op, maar nu wel. Ik last laatst ergens in een tijdschrift dat L'Oreal al sinds 1989 niet op dieren zijn getest. Yeah rightttt. ah, the controversial topic here! i don't really care about whether they did testings or not tbh, scientific advances needs animal testings, i mean, a lab gotta has white mice right? if not for them we probly won't have the things we have today now...just my two cents. I try very hard to avoid using products tested on animals because I do think it is very animal unfriendly! Though I think it really depends on the testings etc. To be honest I go with the other argument - I like to think that they're safe to use, and the most realistic option is animal testing. Unless everyone is willing to volunteer themselves to be subjected to testing it's going to be animals until we can develop a substitute which is more sustainable, cruelty free and cheaper. @Suteisi, yeah you won't get that guilty feeling if you use products that aren't tested on animals. that's great ^_^! I hope that they will find an other way to test cosmetics that won't harm any animals/humans. @Sam, ik begrijp 't, niet gebruiken is ook jammer inderdaad want je hebt er wel voor betaald. @Ice pandora, lol 1989? geloof ik niet XD !!! @Mitchin, jup, i was also shocked when I saw that shiseido is also testing on animals x___x" I didn't know that!! @Yak man, hahaha ik ook .. ik heb ook een hele garnier lijn thuis zitten.. maar ik had geen idee dat ze op dieren gingen testen x__x"! Ik heb nog een aantal producten die op dieren getest zijn, maar ik koop het nu zo min mogelijk nieuw. Maar het is ook heel cru. Sommige producten zijn niet op dieren getest, maar de ingrediënten wel. Body Shop is dierproefvrij, maar onderdeel van L'oreal die wel op dieren test en daar gaat het geld dus heen.. En sommige van mijn favoriete producten zijn van een merk dat proeven doet, zoals Max Factor False Lash Effect. and you're totally right, lots of people just ignore it, they don't care about this issue. They just want good products for themselves. alot of my facial washes and body washes and masks say they are not tested on animals but for my make up it normally does not say. I think animal testing when finding a cure for cancer for example is okay. To be frank I'm not aware of this because when I go shopping I just grab what i need and go out to pay. I dont normally take the time to read the little prints because they are realllly small and annoying. Memorable Days written by Elisa, based in The Netherlands. Find my reviews about (Asian) beauty products here.